Northbound Big Four local at Rushville IN on joint track. Highway north of NKP Depot is US 52. There is a lot of things going on in this photo. This was NKP track and the operation over it was the same from 1890 until the closing of the track around 1980 . There was about 2 miles of this track in Rushville . Operation was like this, when we came to town from the north or south we stopped at the ends of this track, if the way was clear, you started moving to the other end of this track. All trains that were in this 2 mile of track proceeded looking out for other movements prepared to stop. Coming from the north you made your stop, pulled down 40 car lengths and stopped for the B&O, got the signal, pulled down another 30 cars and stopped again. This was just a sign that said stop, if it was clear you proceeded south on your own railroad under the signal you had at our depot. 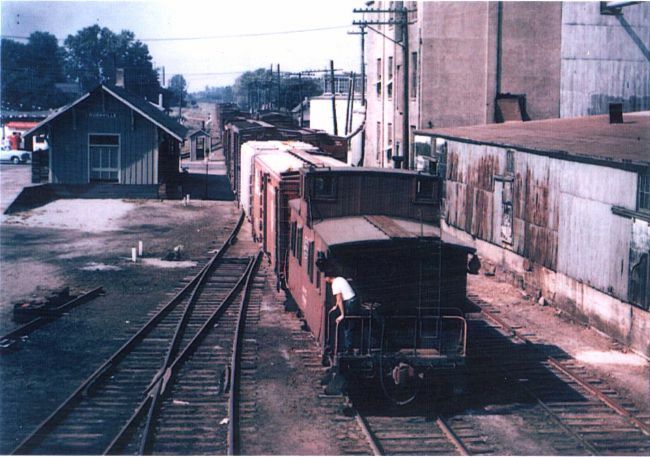 The depot in the photo is the NKP and if you look between the depot and the train you can see the crossing watchman's shanty and to the left of the depot is one of those one man filling stations with 2 pumps with gasoline about, 25 cents a gallon. It was straight track as you can see in the photo. After stopping, you proceeded at restricted speed. At the B&O, it was a gate until about 1948, then the B&O went automatic block and a dwarf signal was installed for the NYC. We would push a button on the signal post to get the signal. At the next stop, which was a stop board, you stopped, looked both directions and if clear proceeded. This applied to all trains, Passenger or freight. It was up to the men on the trains for the movements. We were going south with about 100 cars and pulling down to the B&O. The NKP was switching and the only track open was a 25 car siding you can see next to the elevator. After talking it over we took our train through the siding and back on the main at the south end with the NKP crew taking care of the switches. Dispatcher or operators were not used in any way .